The Lady Camels and Camels are back in action tonight to take on Laramie. The Ladies tip off at 6p and the Camels follow. Listen to the play by play coverage starting at 530p with “Pistol” Pete Scherr and Kelvin Glaser on KOAL 106.1 FM and streaming on this site. The Gillette Camels took their undefeated record to the state championship game vs. Sheridan Saturday in Laramie. The Camels fell behind in the first half 31-7 but mounted a comeback in the second half to come up just short losing 38-31. The Gillette Camels take on their old rival Sheridan for the 4A state football championship Saturday in Laramie. 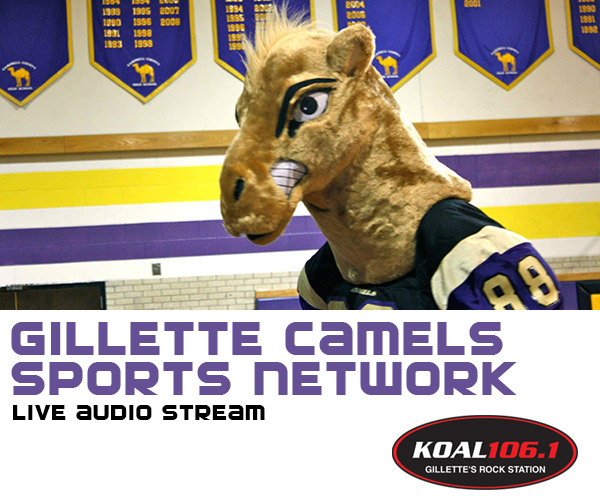 It’s the Camels vs. the Broncs Saturday afternoon, listen to the play by play coverage starting at 330p with “Pistol” Pete Scherr and Kelvin Glaser on KOAL 106.1 FM and streaming on this site. The Camels started the state playoffs with a dominating win over Laramie 73-33. This week they host Cheyenne East in the second round. Listen to the play by play coverage Friday night starting at 530p with “Pistol” Pete Scherr and Kelvin Glaser on KOAL 106.1 FM and streaming on this site.